We’re in the business of serving people and that means at Bad Axe Throwing, we get to be a part of many memorable nights. To us, it’s a privilege and we take it very seriously. It’s very important that we provide an incredible experience to everyone who passes through our doors, whether they’re coming for a casual drop-in session or celebrating a milestone birthday. 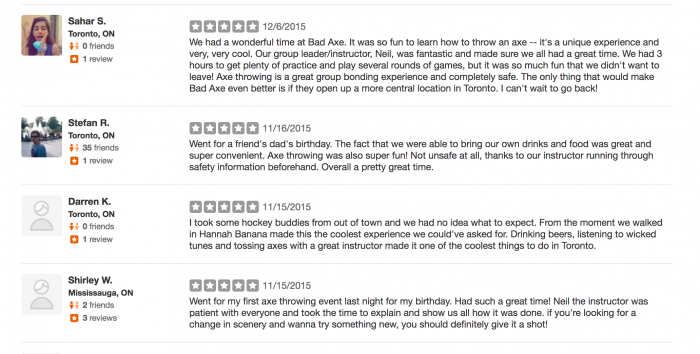 We feel each of our Bad Axe Throwing locations create the kind of environment for thrills, laughs and all around good times. Our customers come first and without them, we wouldn’t even exist. Period. As with any good business, we welcome feedback—positive and negative—because it helps us ensure a consistent, top quality experience for everyone across all of our venues. 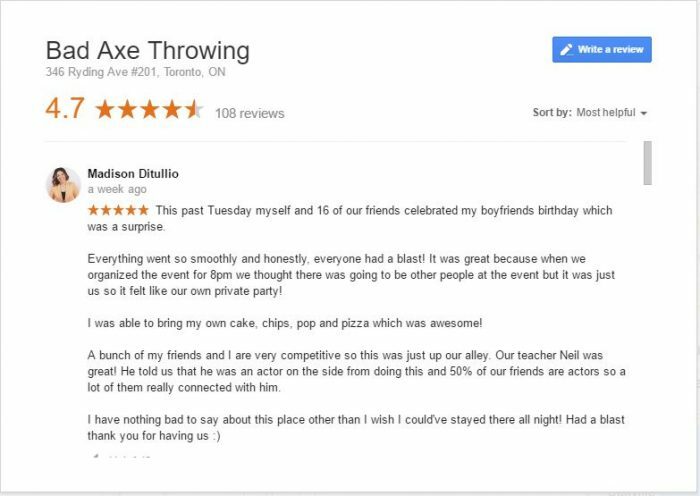 It also guarantees that all of our customers understand that our axe throwing philosophy is rooted in pure FUN. Reviews are critical to any business improving, especially one that is continuing to expand across North America. And we never want to stop getting better and better! That said, there is one reviewing platform that seems flawed: Yelp. On one of our pages, we currently have 6 Yelp reviews that can be viewed and 31 that are hidden from our customers and identified as “not recommended.” We feel consumers could be getting a very skewed version of the truth as we have proof these customers came into our business. Here’s a perfect example from one of our many locations where we have legitimate reviews, but Yelp decides to hide them. Yelp has done a great job to prevent businesses from posting fake positive reviews to boost their rating. They don’t want business owners to recruit their friends and family members to write positive reviews or even pay people who aren’t customers to write positive reviews. We understand that, but the Yelp rating system promotes something worse—the ability for competitors to leave horrible negative reviews. We’re not alone in experiencing this flawed system. Many other businesses claim they feel Yelp manipulates its rating algorithm so that if businesses do not advertise on Yelp, then their positive reviews suddenly become hidden in the “not recommended” section and their rating take a deep hit – we refuse to advertise on Yelp because of the issues with their rating system, so we cannot comment on whether or not this claim is true but Yelp has been accused in the past of hiding reviews for paying customers. Other platforms like Google or TripAdvisor are more unbiased with their ratings. Their algorithms are more sophisticated and do a better job of detecting a real review versus a fake one. For example, Google can use a phones geo-location to determine whether or not you were actually at a location – unless you have the Yelp app, there’s no way for Yelp to know this, other than your click behaviour and how you left the review – a very flawed system. As a business, we always read every single word of a review, but we’re not sure consumers do the same. They tend to be influenced by the average rating off the bat. Some reviews may receive an average star rating but the actual review has nothing but positive things to say! Luckily, there’s a lot of valuable and trusted sources for reviewing out there, most notably Google reviews and TripAdvisor. Both of these platforms also validate whether a reviewer has visited a particular location. TripAdvisor rated us #1 in Fun and Games in Toronto. We plan on achieving more of these honours in our other cities of course. All reviews help inform us of how we can do better and take our business to new heights. We will continually look to our customers for how we can develop into the best axe throwing business they’ve ever been to. So send us your comments, rate us on Google reviews or TripAdvisor and know our focus is always you. You’re our #1! Several weeks ago, we had a call from an account person that manages businesses that have multiple locations like ours. We were clear that we did not have the budget for Yelp and the $2/click on top of the many other fees they wanted. After we made our position very clear, our page in Winnipeg went from having 13 reviews and a 5 star rating, down to 1 review and a 1 star rating. Coincidence you might ask? Definitely not. After doing some quick reading, it appears to be a tactic that Yelp seems to use to bully small businesses into buying their services. Businesses feel extorted,’ Milliken told Daily Mail Online. ‘After they decline advertising services from Yelp they feel like their good reviews get filtered out and their negative reviews come to the front. There has been a lot of write-ups and published cases of exactly what we’re describing above. Yelp claims that their algorithm helps spot fake reviews but shows about 75% of reviews. When the algorithm decides to kick-in, after a salesperson makes a call offering you to get rid of bad reviews and you as a small business owner says “no, thank you”, that doesn’t sound like much of an algorithm – it’s more manual intervention. What makes it even funnier is the fact that researchers have found a way to cheat Yelp’s algorithm by writing fake reviews – humans nor the AI bot created to accomplish this could tell the difference between real or fake. Unfortunately for us small businesses, the courts don’t seem to find that what Yelp is doing with their ratings as illegal. To mock the Yelp rating system, one small business took an interesting (and hilarious) approach: they offered 25% off their meal for 1 star ratings on Yelp. In the end, they got a lot of publicity and became the worst rated restaurant on Yelp! Our approach to Yelp has always been to encourage our customers to view the hidden reviews. As an example, our Toronto location has 32 reviews hidden – take a wild guess at what the star ratings were for them all…If you look at the same Toronto location on TripAdvisor, you’ll see that we’re the #1 fun & games activity in the largest city in Canada. We have 210 reviews there & received the Certificate of Excellence. We no longer care for Yelp – they will never get a penny from us. It’s only a matter of time until the movie documenting all this, Billion Dollar Bully is released and the public knows to question or distrust the Yelp rating system.